Scandinavian style is big news, and the best reveal is that we’ve come up with a great way to get the look for less. This hanging shelf is a simple way to embrace a serious design trend, while giving you some chic space for storage. As it turns out, design-wise we’ve got a lot to learn from the Scandinavian countries of Denmark, Norway, and Sweden. Last year we were all about ‘hygge’ and the Danish belief in creating a cosy environment to come home to. This year, the Swedish idea of ‘lagom’ to is influencing our interior style. Lagom is all about finding ‘the right amount’, and it’s an approach that extends beyond how we decorate our homes. The idea urges realistic approach to balance includes a ‘conscious’ approach to buying, and a considered evaluation of we spend our time. Scandinavian style also means embracing ‘slow design’, or valuing pieces that are carefully crafted and designed to last. It’s a philosophy that turns some traditional thinking around. For example, rather than hiding things away and trying to make your storage units invisible, why not make them a centrepiece? Choose plain pieces with beautiful baskets or shelving to display special objects, or look for ways cleverly hide your clutter in plain sight. We love that this hanging shelf does just that, while being an easy DIY project. Choose a length of wood. Pale hardwood is central to the aesthetic, although you can stain or oil the wood if it works better for your interior. Leather straps are key to creating this look. 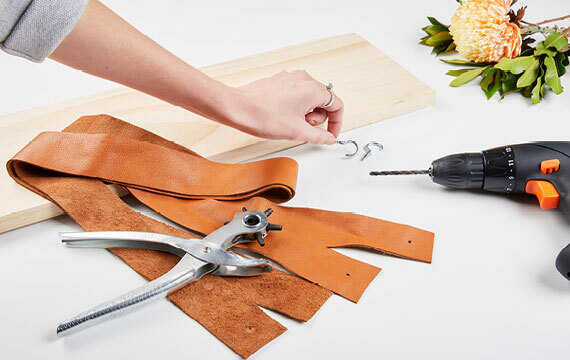 If you can’t find a tool to punch holes into the leather or are worried about doing it yourself, head to a shoe repair or key cutting booth, and ask them to do it for you. You’ll need two hooks, and a drill. If you’re renting and are worried about drilling the hooks into the wall, you could look at using hooks that stick to the wall without leaving a mark. If you take this option pay close attention to the amount of load that the hooks are designed to take. Remember to add up the weight of the shelf and everything that you’ll be placing on it. 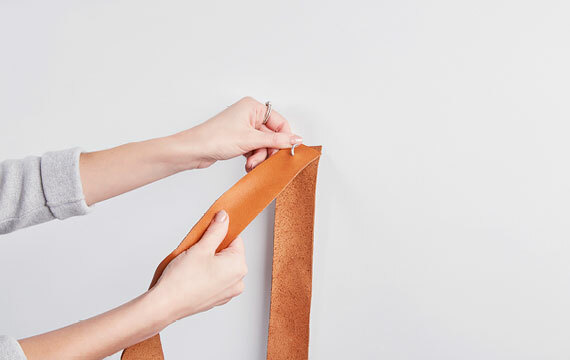 Once your hooks are in place, hang a leather strap from each hook, creating two loops. Hang your length of wood from these loops and voila! 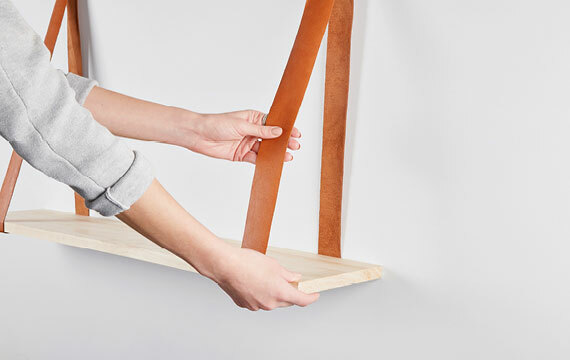 You’ve got an easy, Scandi-style hanging shelf. This is a great place to pop a few special objects. Perhaps add a plant for a pop of greenery, a few treasured books, or loved items like a vintage camera.